Gardell says she’s always been a workaholic, including her school years. You could say it’s reflected in her grades. Try a 3.96 undergrad GPA and a 4.0 grad GPA, both from Lehigh University, which she attributes more to hard work than being super smart, not that she’s short in the brains category. 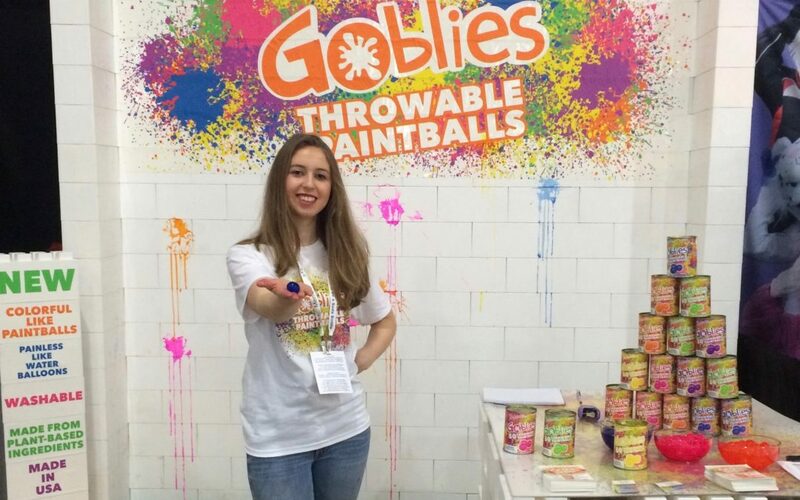 It was during her graduate studies (Masters of Engineering, Technical Entrepreneurship) that she invented Goblies, which are going nationwide this year. The professor gave them an assignment to use a manufacturing technique to create something. “So I used the manufacturing technique that is used to create balloons,” Gardell explained. There was some trial and error as the product evolved. To track her progress, she used the Day One journal app, and at one point made a note that this could be her next business idea. That was that. “I remember emailing my professor about it. It took 26 prototypes to get anything to work or function, to actually break. Then it was like 1 million prototypes to take it from that to where it could be mass produced.” A million is an exaggeration, of course, but that’s how it can feel. Halloween of 2014 marks the day she created her first successful Goblie. The next month she won the Eureka! Ventures Competition, a coveted entrepreneurship prize awarded to Lehigh grads and undergrads. With the judges being other entrepreneurs, it gave her some needed verification that she was onto something. So in May 2015 she formally founded the business. All told it’s been over three years of grind, but with a potential payoff now in the offing. What is striking is that Gardell would like to eat and exercise right in order to be able to handle more work and more stress. Yup, she’s a quintessential entrepreneur, you could say. Like others we’ve talked to, that desire to be an entrepreneur goes back to when she was much younger. “I’ve always wanted to be an entrepreneur since I was in high school when I wrote my first business plan for a class,” Gardell explained. “So that was my first taste, myself, of what entrepreneurship can mean, and I was just really attached to how creative and challenging it is of thinking of an idea and how to grow it. I was just really attached to it, and that wasn’t necessarily logical, because for a long time, I felt like saying I wanted to be an entrepreneur was like saying I wanted to be a rock star but I didn’t even have a song. The takeaway here appears to be that while some entrepreneurs might not find what they learn in college entrepreneurship classes all that useful (so we’ve been told), there is the energy, the camaraderie, the infectious I can do this! attitude. Another pivotal experience for her at Lehigh was running an entertainment club that put on concerts and comedy acts. She managed 20 people and the budget. “That experience allowed me to get hold of this notion that people love success but they don’t always love the risk that it takes to get there,” she reflected. When you think about it, founding a company isn’t too different than getting up on stage in front of a fickle audience. Circling back to those 15 or 20-minute recovery breaks to watch YouTube videos or grab some food, we wondered if this workaholic had taken any weekends off or even a vacation since launching Goblies. “I’ve noticed one thing about the quality of life thing,” she answered, “I’m definitely afraid of making plans over the weekends because I’m not sure what’s going to come up or how much work I have been able to get done, so I’m kind of hesitant to make plans.” At the same time she acknowledged that post-college you have to make plans with friends “because you can’t just walk out your door and there are all your friends.” She has taken some weekends off, to see her old roommates, for friends’ graduations, and now weddings. But you get the sense they are far and few between over the last two and a half years. From her experiences, Gardell has some interesting observations about success as an entrepreneur. “I’ve continued to say that I want to be an entrepreneur since I was 14. I think that by saying I wanted to be an entrepreneur for so long helps me justify it in my own head. To think about it, and read about it, and ingrain it into me, and tell other people in my life what I wanted to do – I think it made it a lot easier to take that step regardless of the supportive or unsupportive people around me.” Without that mindset at an early age, she believes “it would’ve been a lot harder to mentally deal with the consequences and risks and perceptions of who you are as an entrepreneur.” Especially when you’re toughing it out and scraping by to support yourself. Moreover, Gardell noticed that in her entrepreneurship classes not everyone who came in was interested in becoming a full-fledged entrepreneur and would struggle with taking the plunge: “I found that people who said in the beginning of the program that they don’t want to be entrepreneurs, or that they’ve never really thought about being an entrepreneur, having a lot harder of a time stepping off the diving board and diving in.” This reinforced her belief that being attracted to the idea for a long time has helped her deal with the emotional side of it. With Gardell clearly having the passion to be a serial entrepreneur, we asked her where she envisions herself in ten years time. For the moment she’s not letting herself think of other products or businesses because she’s intensely focused on growing Goblies. But that’s just for the moment. “I really like this flexible entrepreneurship lifestyle,” she said, and then emphasized that she loves all aspects of it, the creativity that goes into marketing, selling, growing the business, and even the accounting. You don’t hear that often, especially the accounting thing – but again, it’s all about passion in the final analysis.